The Transportation data theme consists of roads, airports, trails, railroads, and other features associated with the transport of people or commerce. USGS data portray selected Structures data including schools, fire stations, police stations, visitor centers, post offices, and hospitals. Boundaries data or Governmental Units represent major civil areas including states, counties, Federal, and Tribal lands, and incorporated places such as cities and towns. The National Land Cover Database (NLCD) serves as the definitive Landsat-based, 30-meter resolution, land cover database for the Nation. NLCD provides spatial reference and descriptive data for characteristics of the land surface such as thematic class (for example, urban, agriculture, and forest), percent impervious surface, and percent tree canopy cover. NLCD supports a wide variety of Federal, State, local, and nongovernmental applications that seek to assess ecosystem status and health, understand the spatial patterns of biodiversity, assess effects of climate change, and develop land management policy. NLCD products are created by the Multi-Resolution Land Characteristics (MRLC) Consortium, a partnership of Federal agencies led by the U.S. Geological Survey. Please see https://www.mrlc.gov/ for more information. Orthoimagery data typically are high resolution aerial images that combine the visual attributes of an aerial photograph with the spatial accuracy and reliability of a planimetric map. Most orthoimagery available through the National Map for the conterminous US is data obtained through partnership with the National Agriculture Imagery Program (NAIP), available as 4 band imagery at resolutions of 1 meter or better. Data Downloads are available at: https://viewer.nationalmap.gov/basic/. The 1997-2014 Edition of the National Atlas of the United States was retired in September 2014. However, The National Geospatial Program (NGP) recognizes the importance of continuing to make a collection of the small-scale datasets, originally developed for the National Atlas, available to users. The National Geospatial Program (NGP) has evaluated the collection of 197 small-scale datasets that were originally part of the National Atlas to identify a subset of data that is especially relevant to small scale topographic mapping and is used on TNM web services and in TNM Viewer. This subset of data will continue to be available for download from TNM Downloader. The entire collection of 197 small-scale datasets, as well as small scale maps and web services will continue to be freely available for download and access from TNM Small-Scale Data Collection website through 2019, and then will be retired permanently. 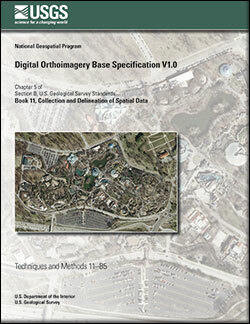 Digital orthoimagery base specification V1.0; 2014; TM; 11-B5; Section B: U.S. Geological Survey Standards in Book 11 Collection and Delineation of Spatial Data; Rufe, Philip P.
Mauck, James; Brown, Kim; Carswell, William J. 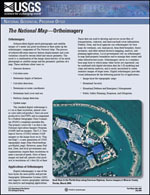 The National Map - Orthoimagery; 2009; FS; 2009-3055; Mauck, James; Brown, Kim; Carswell, William J., Jr.